Aptitude tests are being used more and more in the workforce. These tests are one of the best ways to see if a potential employee is going to be able to deliver the performance that you desire. During an interview, you have probably had candidates tell you that they have experience and can easily perform the duties of the job. Once an aptitude test has been given, you will have your answer as to if they will be able to do the job or not. An aptitude test is a measurement of a person’s ability to learn or to perform. Aptitude tests determine a person’s competency level. This test may measure a person’s physical or mental ability. For instance, if you are hiring for a job that requires an employee to lift a box that weighs 50 pounds and put it on a shelf, then you would use an aptitude test that requires physical elements into it, such as examining how much a person can lift. If your job is more of a mental job, such as using a computer for the duration of a shift, then you will need to use an aptitude test that measures mental abilities not physical competencies. As we said earlier, aptitude can measure physical or mental competencies. Mental aptitude tests are more commonly used in the workforce. There are several types of mental aptitude tests which include: clerical, verbal reasoning, numerical reasoning, spatial ability, abstract reasoning, and mechanical reasoning. Clerical aptitude tests are used to determine a person’s level of concentration and accuracy. These tests are usually timed to measure speed and are scored based off of accuracy also. These exams are often given to people in accounting and billing because an error in finances can be extremely costly. Verbal reasoning aptitude tests are used to measure a person’s ability to spell, use grammar correctly, understand terms, and comprehension level. The spelling portion of this test involves presenting the test taker with four or five different spellings of the same word or presenting four or five different words and having the test taker to choose the word that is correctly spelled. The grammar section will present a number of sentences, usually the same sentence, with different variations of grammar, with only one correct answer. Another section involves understanding terms and their definitions. This may be presented as asking the test taker to choose the definition to a word or by choosing a word that is opposite of the word that is underlined or in bold font. Comprehension level is often measured by having the test taker to read a paragraph or several paragraphs and then having them to answer questions about it. Numerical reasoning aptitude tests are meant to measure the competency level of a person based on their understanding of numbers, graphs, tables, and calculation. Most of these tests are design to be completed without using a calculator. Question on this portion of the test may ask the test taker to answer questions about a table or graph. Also, the test taker will be asked to solve mathematic equations. Spatial ability tests are designed to evaluate the test takers ability to rotate and manipulate shapes and designs. The test taker will be given shapes or pictures and asked to mental rotate the object to match a picture and then choose the correct answer. Abstract reasoning asks the test taker to solve problems by analyzing patterns and trends and choosing the correct answer. The question will usually show three shapes or pictures and will have the test taker to choose the next shape or picture that will appear in the series. Mechanical reasoning will measure a person’s ability to take a mechanical principle and use it to solve a problem. This test will ask a question based off of mechanical principles and will only have one answer. Why should aptitude tests be given? Sometimes using work history and an interview just is not enough when making your final selection for employment. A candidate may feel that their previous work history has given them enough experience to efficiently perform the duties of the job, but that may not be the case. In some instances, a candidate may lie about their competency level just to get the job. If you hire someone who you believe can do the job, just to later find out that they can’t, could put you in a terrible position, as an employer. 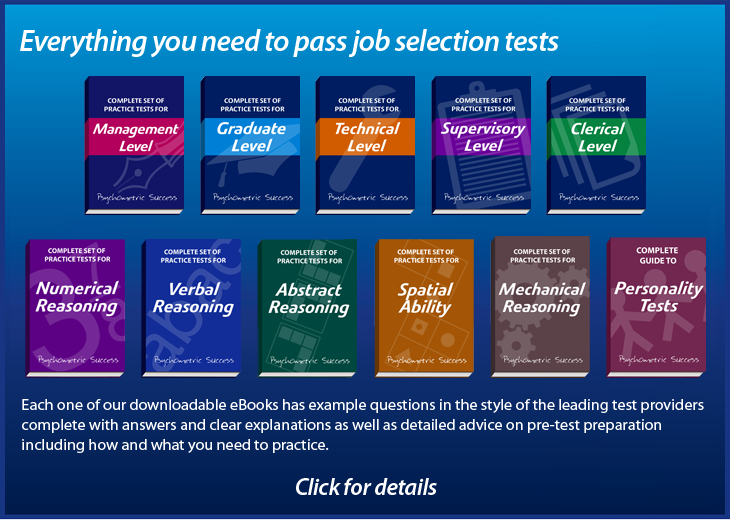 Who should include aptitude tests into their application process? The simply answer is everyone. Every employer, no matter the career field or industry, could benefit from learning more about their potential new employee. If you know what area the applicant excels at, it can help you to better place them in a work environment that they will excel at, which benefits your business. You will also be able to strengthen your team by recruiting people who will actually have the ability to perform the essential duties. It does not help anyone to hire a person, train them, only to find out that they are simply not able to perform the job. That will waste your time and the employees time as well. As an employer it can be very hard to choose a candidate to hire, due to the large pool of people that will apply to your business. It is important to hire someone that has the skills necessary to perform the job. Giving aptitude tests to candidates will allow you to identify who has the competency level that you are looking for. By scoring the candidates aptitude you will be able to judge their ability to learn and to perform the job duties.